Represents an attribute applied to a statement. Definition at line 1694 of file Stmt.h. Definition at line 1740 of file Stmt.h. Definition at line 1742 of file Stmt.h. Definition at line 1746 of file Stmt.h. Definition at line 344 of file Stmt.cpp. Definition at line 353 of file Stmt.cpp. Definition at line 1729 of file Stmt.h. Definition at line 1730 of file Stmt.h. 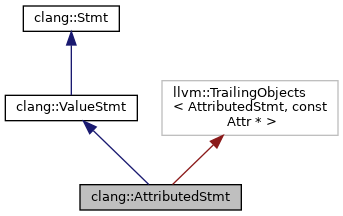 Referenced by clang::TreeTransform< Derived >::TransformAttr(), and clang::ASTNodeTraverser< Derived, NodeDelegateType >::VisitAttributedStmt(). Definition at line 1737 of file Stmt.h. Definition at line 1738 of file Stmt.h. Definition at line 1734 of file Stmt.h. Definition at line 1735 of file Stmt.h. Definition at line 1697 of file Stmt.h.